Aspergillosis is one of the most frequent mycosis affecting avian species. Here is reported an outbreak of aspergillosis affecting 60-day-old white Pekin mallards (Anas platyrhynchos). About 10 % of animals in a lot of 200 mallards from a commercial husbandry presented respiratory disorders and skin lesions at slaughter. Three out of 13 animals sent to diagnosis showed, simultaneously, airsacculitis, lung and liver presenting white nodules with variable diameters and elevated, yellowish brown, crusted, multifocal skin lesions located at the base of the feather follicles in the breast. 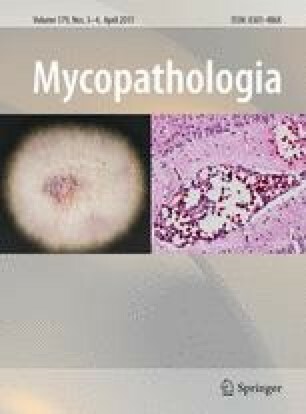 Histopathological examination of lung and liver samples revealed nodules of different sizes with small areas of necrosis surrounded by intense granulomatous inflammation and the presence of fungal hyphae. The skin samples showed dermatitis surrounding a severe necrotizing folliculitis, associated with fungal hyphae. Mycological evaluation of tissues allowed the isolation of Aspergillus fumigatus from the skin samples and Aspergillus flavus from lungs and liver samples. The application of quicklime (CaO) in the litter as part of the disinfection procedures could have contributed to the development of skin lesion in the mallards, predisposing the fungal installation in the damaged site. The occurrence of cutaneous lesions associated with A. fumigatus is a rare manifestation of aspergillosis in birds, and this appears to be the first case reported in white Pekin mallards. Schwarz M, Lindbloom A. Fungal infection results in mallard die-off near Pierre, South Dakota. http://www.fws.gov/mountain-prairie/pressrel/11-15.htm (2011). Accessed in Feb 2014. Arne P, Thierry S, Wang D, Deville M, Le Loch G, Desoutter A, Féménia F, Nieguitsila A, Huang W, Chermette R, Guillot J. Aspergillus fumigatus in poultry. Int J Microbiol. 2011;746356. doi: 10.1155/2011/746356. Anonymous. Material safety data sheet for quick lime. Oldcastle industrial minerals. https://ehs.cranesville.com/msds.pdfs/MSDS(L012).pdf (2007). Accessed in Feb 2014.